Time for our last day in Osaka! We had an 11:30 PM flight so packed up our bags, stuffed them into a train locker at Osaka Station, and went out for the day. First stop was to our last onsen of our trip! Wandering through a pedestrian alley filled with shops, then into a nondescript building with a smoky pachinko (gambling) parlor on the bottom floor, we saw a sign that said “spa” and took the elevator up. This one was on the rooftop of a building in the city! Here you h ad to order what you wanted from a vending machine, including towels, then take those tickets exactly ten steps to the right and hand them to the people working there. Why we couldn’t just order directlyfrom the workers is beyond me, since they were otherwise rather bored looking. One thing I’ve noticed here is that there are always more people at a job than needed, like every cash register always has at least two people working at it, one to handle the money and another to wrap your purchases. Anyway, back to the Onsen. Not as plush as the last one we were at, but still so fun. The ladies tried to talk to me in Japanese, and not for the first time I wished I spoke the language. We bickered about lunch before finding a 7-11 and getting some onigiri. I swear, those 7-11s saved us so many times. 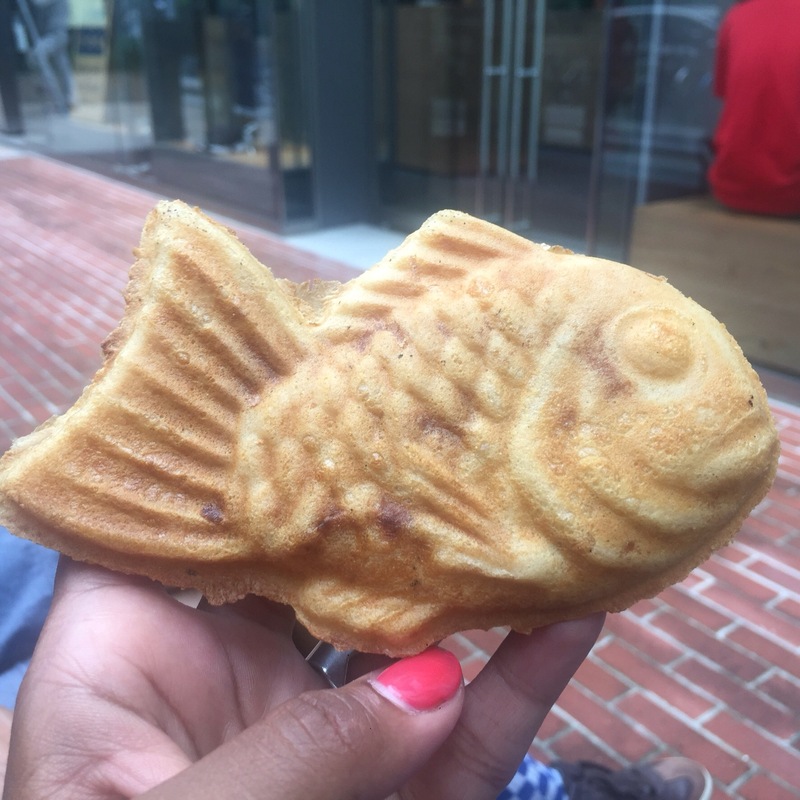 There was a fish shaped filled waffle stand too, and we got some really yummy sweet potato ones! We had bought movie tickets the day previously, finally able to see “the BFG”! Movie tickets in Japan are notoriously expensive, with regular prices at $18/ticket. Luckily, there are a lot of random discounts. We used the one for “ladies day” and “couple with one person over 50” and paid $11/ticket, which is less than most American theatres. Trying to find a movie in English in Japan is tricky, what with the sites in all Japanese and not always obvious if a movie is subtitled or dubbed. I actually had to match Japanese characters to try and figure it out. Still, we weren’t entirely sure if we’d chosen wisely. The movie starts with nearly five minutes of silence and then random scuffling sounds before anyone utters a peep, but when they did, it was in English. Ahhhhh. I nearly wept in happiness at being able to understand people other than my family talk for a full two hours. Outside of the theatre was a pile of neatly stacked blankets to use for the show. The thing is, it’s not that cold in the movie theatres or anywhere indoors really as an electricity saving measure. Still, how could you not snuggle under a blanket? 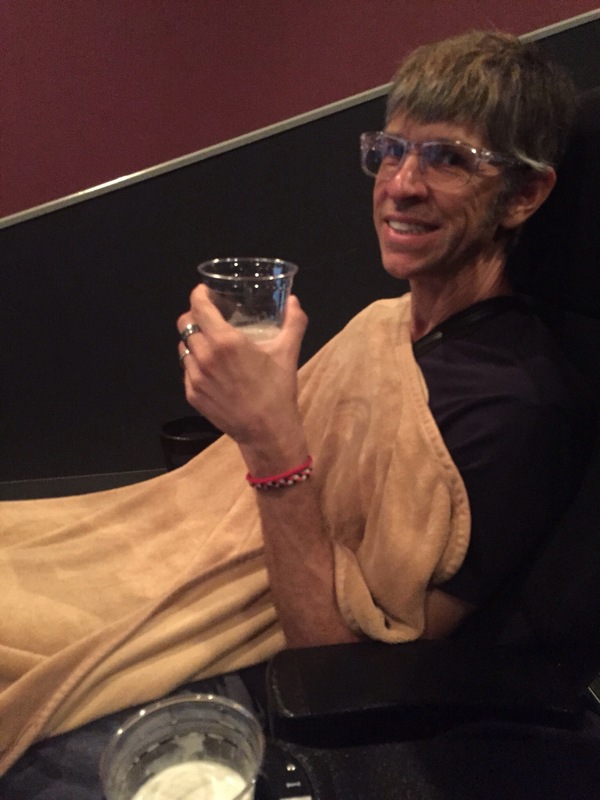 Here’s Eric cozied up in his blanket, drinking a beer just before the movie. The other thing is that the Japanese are SILENT during the movie. I mean, there were a lot of funny parts and we and the kids were laughing, but the Japanese watchers (all ten of them) did not make a peep. They may have thought we were rude for laughing, but it seemed ridiculous to tell my kids be silent while watching characters shoot across the screen farting powerful neon green bubbles. The BFG is a movie that uses a lot of made up words and language jokes (For example, the character says “right and left” when he means “right and wrong”) and I couldn’t help but wonder how this could possibly be translated and keep the same feeling. Of course, it’s probably the same when we watch the Miyazaki movies in dubbed English – something isn’t quite carried through. After this was dinner, which of course had to be one last stop at conveyor belt sushi, on the top floor of the mall attached to the Osaka train station. Then to the airport, where we bid a sad sayonara to Japan on our way to Budapest and then Romania, the first leg of our journey coming to a close.